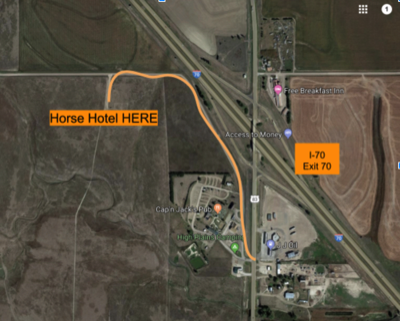 North Fork Horse Camp & Motel is located 1/2 mile off of Exit 70 on I-70 and Hwy 83 Intersection. Go 100 yards south of junction of I70 and Hwy 83. Turn in front of Steak House. Follow the road in front of Steak House 1/2 mile around the corner. WITH BEING A NEW FACILITY, GPS WILL NOT WORK TO GET YOU TO FACILITY. Please follow the map on website.